AN ELEVEN-FOOT snake gave business owners a scare yesterday (Thursday, July 30) when it escaped from a reptile storage centre behind Millsborough House. The owner of the python, Eliott Guy, had taken the animal outside for a bath in a plastic container and to give it some fresh air. 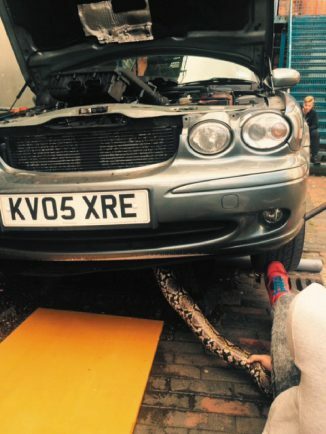 However no sooner had the giant snake got into the open air but it made its getaway, sliding under the car of next door neighbour Myk Garrett of The Redditch Photographer. It took a team of mechanics two-and-a-half hours to dismantle the engine of Myk’s X-type Jaguar to get in close enough to pull the snake, valued at over £200, out. 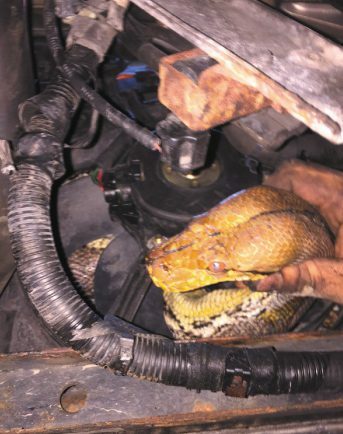 The python had slithered under the car and then wrapped itself between the fan and the radiator in the engine compartment. Pythons are cold blooded creatures which live in the wild along the equatorial belt in continents like Africa, Asia and in the southern United States. They can have huge bodies and rely on heat from the sun to keep them alive and to give them energy. In the wild they can feed off anything from pigs, goats, dogs and chickens, killing them by crushing them to death in their powerful coiled bodies. In captivity, provided they are kept well fed, they are relatively docile and can be popular pets. The snake was unharmed by its adventure and has since been returned to its tank in the store.